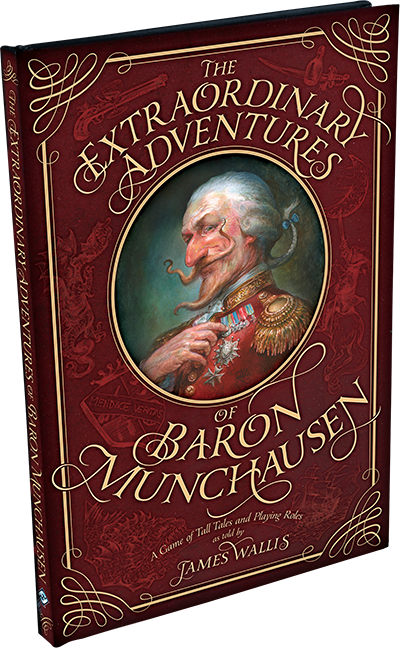 Thus begins a new story in The Extraordinary Adventures of Baron Munchausen, the game of tall tales and grand boasts. Here you and your fellow players adopt fictional guises and challenge each other to tell stories of your incredible feats and gallant adventures, while competing to make your tale the most fantastical and outlandish, for surely your own escapades are the greatest of them all! You can dispute other player’s stories, forcing players to accept objections or add new detail, thus making their own tales more extraordinary. A perfect game for the creative holiday gathering of gamers and non-gamers alike, as the game requires only minimal materials and a desire to be ridiculous. We encourage dressing as members of the 18th century nobility of your choice during play.